About Us - Furuya Metal Americas Inc.
Our office, located in beautiful Manchester, New Hampshire serves as our Americas Branch. We offer Precious Metals Manufacturing, Recovery and Refining for industrial and analytical applications. We also offer a variety of analysis tools, sensor products, thin film products, sputtering targets, and precious metal chemical compounds. Almost all of our products can be customized or made to order. Furuya Metal’s core products consist of precious metals. Among them are the platinum group metals (PGM, including platinum, iridium and ruthenium), gold, and silver. These metals can withstand very high temperatures, are chemically stable, offer high electrical conductivity, and more. They support the development of leading-edge technologies like smartphones, tablets and other mobile devices, and memory cards. These materials make medical testing equipment, touch panel displays, LEDs, OLEDs, and chemical catalysts possible. Furuya Metal is a research and development led company. We develop many varieties of alloys and technologies for special needs; such as equipment used in extreme environments. We are open to collaborative research on products in new applications and environments. Please contact our office if you come across any needs you think we may be able to meet. 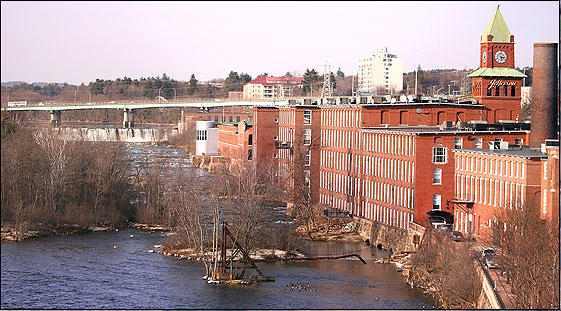 The west side of the Waumbec Mill building, overlooking the Merrimack River.